Game Four of the NLCS was like an epic action movie — dramatic moments, heroes both predictable and less so who face rough times, villains also predictable and less so, enough tension to keep you interested up until the very end. 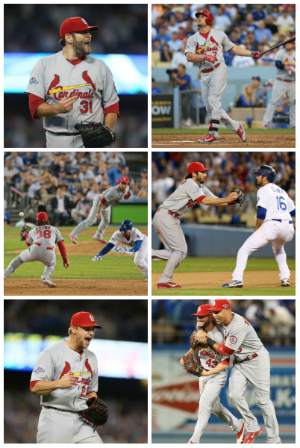 And, thankfully, the right ending with the heroes emerging triumphant: Cardinals 4, Dodgers 2. But the latest installment was ultimately quite fulfilling. And, as with any good story, it’s outcome was not predictable at the beginning. To start with, not everyone was happy with director Mike Matheny’s choice for last night’s lead role, Lance Lynn. And those who voiced such displeasure before the game felt like they were the correct ones when Lynn ran into trouble in the second inning — a quick check of Twitter at the time more than made that perfectly clear. Then again a one-out single, walk, line out and another walk to load the bases, albeit to the catcher with pitcher Ricky Nolasco up next, can cause such reactions. But perhaps Lynn just wanted to keep everyone watching involved in the game, as Nolasco was called out on strikes. Immediately after that, the Good Guys In Red kept the Cardinals audience interested with some welcome action. Daniel Descalso, who started at shortstop, singled and was moved up to second by a Lynn sacrifice. Matt Carpenter finally reprised his role as The Guy Who’s A Great Hitter and doubled to score Descalso. After a Carlos Beltran out (hey, not everyone is a hero every at-bat, or even every night), Matt Holliday took on the part of Big-Time Slugger and launched a bomb way, way out to left — much to the delight of the audience who’d been suffering through watching not just him but the entire team struggle on offense during the entire NLCS. Hits! Runs! Just what everyone in Cardinal Nation was waiting to see! Yet no path for the heroes is ever smooth — that’s just part of good storytelling. So when the bottom of the fourth arrived, it brought about a tense turn of events. Adrian Gonzalez led off with a double, which was followed by a walk to Andre Ethier. Next up — maximum drama alert! — of course was Yasiel Puig, the biggest villain of them all to Cardinals fans (and the Cardinals, as Adam Wainwright would be happy to tell you). And an inside pitch that sent Puig scrambling had the tension in overdrive. Puig singled, which scored Gonzalez, and after a flyout by Juan Uribe, A.J. Ellis singled also to score Ethier. To the plate: none other than beloved former Cardinal Skip Schumaker, pinch-hitting for Nolasco. Wearing blue, of course he’s the enemy. Yet we all know deep-down dear Skippy still loves his Redbirds. Of course we know. He proved it by grounding into an inning-ending double play. Chris Withrow was not nearly as generous to our heroes as Nolasco. Wait, let me rewrite that. He tried his damnedest to be charitable to the Cardinals, giving them gifts — a walk to Lance Lynn and a balk that moved him to third base — they didn’t seem to know what to do with or want to accept. A.J. Ellis was generous as well, as Jon Jay reached first on catcher’s interference after Withrow walked Yadier Molina. Yet David Freese, our past October Hero, wanted to take nothing away from Holliday’s shining moment, apparently — with those two on, he grounded into a double play. Futile battles, close game, Cards fans on Twitter slowly boiling into a greater and greater furor over Matheny’s continued use of Lynn in the role of pitcher … drama! Compelling, can’t-turn-away content! Yes! Sometimes, though, a little predictability is good. Like Matheny finally deciding Lynn’s day (which actually ended up being more than serviceable) was ended once he gave up a single to That Villainous Puig in the bottom of the sixth. Seth Maness was Matheny’s choice for replacement, the one who oh-so-often is Mr. Automatic Double-Play-Maker. He’s faltered a bit in that role recently — more tension! — but not this time. Nope. Thank you, Juan Uribe, for playing your role as victim in the at-bat to perfection. Applause! That brought us to the top of the seventh, moving along toward the final act. Into the battle, Diminutive Reserve Shane Robinson decided to take on the role of Unlikely Hero — he inexplicably hit a home run that just made it into the left field stands. We love surprises! You can’t script October! Although you can certainly make it more dramatic, even with a now two-run lead. Robinson stayed in the game in the bottom of the seventh, Unlikely Hero taking over for Big-Time Slugger in left field. Interesting move by the director? Absolutely. Yet shouldn’t fans know by now to trust his vision? Perhaps, but that’s no fun — and gives Cards fans nothing at all to discuss on Twitter. In as pitcher: Carlos Martinez, who gave up a one-out double to Nick Punto. Uh oh … oh, wait. Punto had a role in the 2011 World Championship Cardinals production. Sure, a bit part and only that year — but rings are forever, loyalties stay true. We all could see the truth: Punto strayed just a little too far toward third on purpose, to help the Cardinals out. Not that he’ll say it. But we know. The final act, the bottom of the ninth, began with Hard-Throwing Closer Trevor Rosenthal into the game. He’d been so very good on Saturday in his most recent performance — would we see a quick three outs like that again? Not this time. Come on! Drama sells! Which is why Andre Ethier singled to start the inning. Sure, it’s predictable, but a battle like this one couldn’t end without one more appearance by That Villainous Puig. Once again, though, The Good Guys In Red took care of him — the villain grounded it directly to Matt Carpenter at second, so he could just tag Ethier and then throw to Matt Adams for the double play. A strikeout of Uribe and, boom — that’s a wrap! That’s a winner! Satisfying ending! Three victories in the series! Will things continue on this victorious path for the Good Guys In Red? Will this afternoon’s Game Five be yet another triumph to send Our Boys along to a championship sequel against a to-be-determined-yet-previous foe from 2004 or 2006? We’ll soon find out, starting at 3 p.m. Central. Joe Kelly returns as Big Game Starter, a role in which he’s excelled previously, while Zack Greinke also is back as Yet Another Villain Out To Deter Our Heroes. One thing is for certain: more drama and tension will ensue. This entry was posted in 2013 Season and tagged Carlos Martinez, Lance Lynn, Los Angeles Dodgers, Matt Carpenter, Matt Holliday, Nick Punto, NLCS, Postseason 2013, Seth Maness, Shane Robinson, Skip Schumaker, St. Louis Cardinals, Trevor Rosenthal by Christine Coleman. Bookmark the permalink. Except that was game 4, and today is game 5. Other than that small detail this was a good piece. More coffee needed — and fixed! Thanks! We’re all kind of giddy right now. GO CARDS! !